Hydrogen gas (H2) is the most abundant element in the universe, and has been reported to act as a novel beneficial gaseous molecule in plant adaptive responses. Radish sprouts are popular because they contain substantial amounts of antioxidants and health-promoting compounds, such as anthocyanin and glucosinolates. Although radish sprouts accumulated more anthocyanin under UV-A after treatment with hydrogen-rich water (HRW), the molecular mechanism responsible is still elusive. To explore these mechanisms, RNA-seq analysis was used. Four cDNA libraries from radish sprout hypocotyls were constructed, and a total of 14,564 differentially expressed genes (DEGs) were identified through pairwise comparisons. By Gene Ontology (GO) and Kyoto Encyclopedia of Genes and Genomes (KEGG) analysis, these unigenes were found to be implicated in light signal perception and transduction, starch and sucrose metabolism, photosynthesis, nitrogen metabolism and biosynthesis of secondary metabolites. The MYB-bHLH-WD40 complex accounted for the majority of the transcription factors found to be involved in anthocyanin biosynthesis, and levels of transcripts for this complex were in accordance with the anthocyanin concentrations observed. In addition, other transcription factors (such as NAC, bZIP and TCP) might participate in HRW-promoted anthocyanin biosynthesis. Furthermore, the signaling processes of plant hormones, MAPKs and Ca2+ might be involved in HRW-promoted anthocyanin biosynthesis under UV-A. The expression patterns of 16 selected genes were confirmed using qRT-PCR analysis. Taken together, the results of this study may expand our understanding of HRW-promoted anthocyanin accumulation under UV-A in radish sprouts. Radish (Raphanus sativus L.) sprouts are commonly consumed due to their potential benefits for human health. The bioactive phytochemicals in radish sprouts include phenolics, vitamin C, chlorophylls, carotenoids and glucosinolates [1, 2]. Color is one of the most striking features of vegetables, and red-skinned radish cultivars, which are rich in anthocyanins, can attract consumers with their lovely appearance. Anthocyanins are important phenolic compounds responsible for plant organ colors such as blue, purple and red . Apart from the well-known physiological function of attracting pollinators, anthocyanins also protect plants from a variety of biotic and abiotic stresses, such as bacterial and fungal infections, herbivory, UV radiation, temperature extremes, drought and nitrogen deficiency [4, 5]. In addition, there is mounting evidence indicating that anthocyanins act as antioxidants to protect humans from cardiovascular disease, cancer, inflammation and other chronic diseases [6–8]. Thus, an increasing amount of attention has been paid to the development of anthocyanin-rich diets. Anthocyanins are biosynthesized via the flavonoid pathway, which is controlled by two types of genes: structural genes and regulatory genes. Structural genes encode the enzymes necessary for anthocyanin biosynthesis and can be divided into the early biosynthetic genes (EBGs) and the late biosynthetic genes (LBGs) . The enzyme products of the EBGs, including PAL, C4H, 4CL, CHS, CHI, and F3H, carry out the early steps of anthocyanin biosynthesis to the formation of dihydroflavonols. 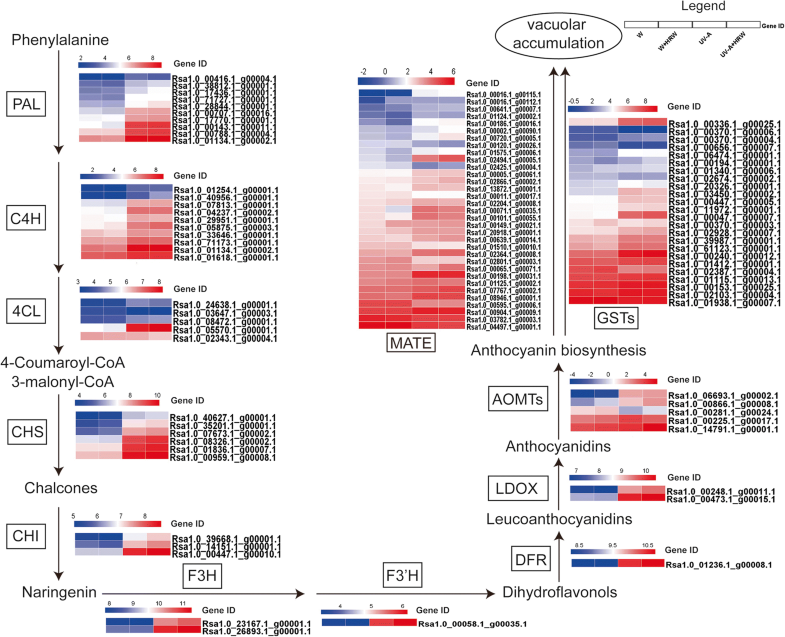 The enzyme products of the LBGs, including F3’H, DFR, ANS, LDOX and UFGT, lead to the biosynthesis of anthocyanins [9, 10]. The regulatory genes, which regulate anthocyanin biosynthesis at the transcriptional level, encode transcription factors (TFs). Three types of transcription factors involved in anthocyanin biosynthesis have been reported: WD-repeat proteins and bHLH and MYB transcription factors [11, 12]. Together, these factors form a ternary complex, the MYB–bHLH–WD repeat (MBW) complex, to orchestrate anthocyanin biosynthesis. Numerous factors have been reported to regulate the biosynthesis of anthocyanins, such as light, temperature, nitrogen depletion, salt stress, sucrose and plant hormones [13–16]. Previous studies have demonstrated that anthocyanin accumulation can be induced by exposure to ultraviolet (UV) light, but most of those studies focused on UV-B-induced anthocyanin biosynthesis. UV-A (320–400 nm), which is in the range of long-wave UV and has lower energy than UV-B, was also reported to induce anthocyanin biosynthesis in Arabidopsis , turnips [18, 19], tomatoes , and blueberries . It is generally recognized that UV-A plays a key role in activating the genes responsible for anthocyanin biosynthesis . Recently, H2 has attracted attention as a selective antioxidant and signal molecule [22, 23]. Studies in animals indicated that H2 acted as a novel antioxidant that selectively reduced the levels of toxic reactive oxygen species  and exerted anti-apoptotic, anti-allergy and anti-inflammatory effects [25–27]. A growing body of evidence indicates that H2 plays an important role in plants, especially in stress defence [28–31]. For example, when H2 was supplied in the form of hydrogen-rich water (HRW), it could alleviate calcium- and salt-induced oxidative stress in rice and Chinese cabbage, respectively [32, 33]. A similar protective effect was found in alfalfa, showing that HRW conferred tolerance to UV-B-induced oxidative damage partially by the manipulation of (iso)flavonoid metabolism and antioxidant defense . In another case, H2 was reported to regulate cucumber adventitious root development . Our previous study showed that UV-A-induced toxicity was alleviated by HRW via the re-establishment of ROS homeostasis and the promotion of anthocyanin synthesis in radish sprouts . However, the regulatory role of H2 in anthocyanin metabolism under UV-A radiation has not been thoroughly studied in radish sprouts. In this study, we used RNA-seq analysis to understand the mechanisms of H2-promoted anthocyanin biosynthesis under UV-A radiation in radish sprout hypocotyls. Thus, based on the analysis of DEGs found by pairwise comparisons, a model regulatory network for H2-promoted anthocyanin biosynthesis in radish sprouts was proposed. The results of our study provide an overview of transcriptomic responses to H2 in radish and thus extend our understanding of the biological functions of H2 in plants. Radish (Raphanus sativus L., cultivar ‘Yanghua’) sprouts were cultured in nutrient medium (1/4 Hoagland’s solution prepared with distilled water or HRW) in the dark for 1 day at 25 °C and then transferred to incubators with white light (W) or UV-A illumination (Ningbo Saifu Instrument Experimental Factory, Zhejiang, China). The light intensity of the white light was 30 ± 5 μmol m− 2 s− 1. The UV-A radiation was 5.5 W m− 2, as measured by a portable digital radiometer for UV (UV-340A, Lutron, Taiwan). The temperature and relative humidity in the growth chamber were 25 °C and 80%, respectively. The nutrient medium was replaced every 12 h. The total anthocyanin contents were measured after 12, 24 and 36 h of light treatment. Hypocotyl tissues were sampled immediately after 24 h light treatment, frozen in liquid nitrogen, and stored at − 80 °C for further analysis. Purified H2 gas (99.99%, v/v) was produced with a hydrogen gas generator (SHC-300, Saikesaisi Hydrogen Energy Co., Ltd., Jinan, China). In our experimental conditions, the H2 concentration in freshly prepared HRW (100% saturation) analyzed by gas chromatography was 781 μmol L− 1 . Endogenous H2 production was measured by gas chromatography (Agilent 7890A, Wilmington, DE, USA) with a thermal conductivity detector . Endogenous H2 concentration was measured by gas chromatography (GC) (Agilent 7890A) . Anthocyanin concentrations in hypocotyls of radish sprouts were measured in accordance with previously described methods . Briefly, 0.5 g of freeze-dried hypocotyl samples were extracted in 5 mL of 0.1% HCl/methanol. (A530–0.25 × A657) g− 1 dry weight (DW) was used to quantify the relative amount of anthocyanin. Total RNA for RNA-seq was extracted from hypocotyls using Trizol reagent (Invitrogen, Carlsbad, CA, USA). The purity and concentration of RNA were checked using the NanoPhotometer® spectrophotometer (IMPLEN, CA, USA) and the Qubit® RNA Assay Kit in a Qubit® 2.0 Fluorometer (Life Technologies, CA, USA), respectively. In addition, the integrity of RNA was assessed using the RNA Nano 6000 Assay Kit of the Bioanalyzer 2100 system (Agilent Technologies, CA, USA). Total RNA from each sample was used for Illumina sequencing at Novogene Bioinformatics Technology Co. Ltd. (Beijing, China). Sequencing libraries were generated using NEBNext® Ultra™ RNA Library Prep Kit for Illumina® (NEB, USA) according the manufacturer’s instructions, and index codes were added to attribute sequences to each sample. HTSeq v0.6.1 was used to count the number of reads mapped to each gene. In addition, the FPKM (fragments per kilobase of exon model per million mapped reads) of each gene was calculated based on the length of the gene and the number of reads mapped to the gene . Differential expression analysis of pairs of groups was performed using the DESeq R package (1.18.0). The P-values were adjusted using Benjamini and Hochberg’s approach for controlling the false discovery rate. Genes with an adjusted P-value < 0.05 found by DESeq were assigned as differentially expressed [39, 40]. Gene Ontology (GO) enrichment analysis of DEGs was implemented by the GOseq R package. 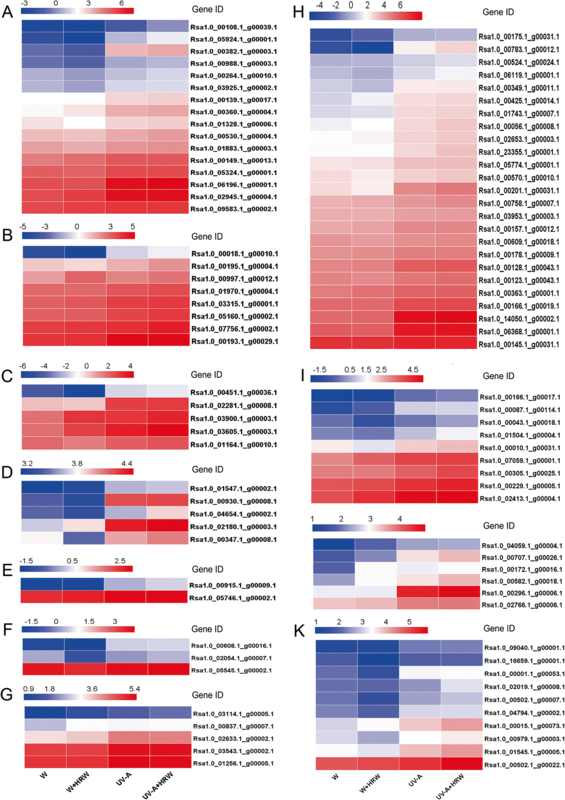 GO terms with corrected P-values < 0.05 were considered to be significantly enriched by differentially expressed genes . KOBAS software was used to test the statistical enrichment of DEGs in KEGG pathways. The transcription levels of 16 genes involved in anthocyanin biosynthesis pathway were analyzed using quantitative real-time PCR (qRT-PCR). Total RNA was extracted from radish hypocotyls using Trizol reagent (Invitrogen, USA) and 1 μg aliquots were treated with RNase-free DNase I to remove genomic DNA and then reverse transcribed using a RevertAid First Strand cDNA Synthesis Kit (Thermo Scientific, USA). qRT-PCR was carried out on a Mastercycler ep realplex Real-time PCR System (Eppendorf, Hamburg, Germany) using Bestar SYBR Green qPCR Mastermix (DBI, Bioscience Inc., Germany) . Reactions were performed at 95 °C for 2 min, 40 cycles of 95 °C for 10 s, 60 °C for 30 s and 72 °C for 30 s. Three biological replicates were applied. The specific primers were designed using the Primer Premier 6.0 software. The primer sequences were listed in Additional file 1: Table S1 in the supporting information. Actin2 and EF1 were used as the reference genes . The relative expression levels of the target genes were calculated using the 2−△△CT approach, with normalization of data to the geometric average of two reference control genes [43, 44]. Statistical analysis was performed using SPSS statistic 17.0 software. For statistical analysis, Duncan’s multiple test (P<0.05) was chosen. Data are means ± SE from at least three independent biological replicates. To assess the effects of HRW on anthocyanin biosynthesis, radish sprouts were exposed to white light (W) or UV-A radiation (UV-A) with and without HRW treatment, and the anthocyanin concentrations were determined after 12, 24 and 36 h of light exposure (Fig. 1). The hypocotyls of radish sprouts grown under UV-A exhibited increased pigmentation, compared with those grown under white light. Moreover, radish sprouts grown under UV-A + HRW showed obviously increased anthocyanin accumulation in hypocotyls comparing with those grown under UV-A (Fig. 1a). As is shown in Fig. 1b, the anthocyanin concentrations of radish sprouts hypocotyls increased in a time-dependent manner. In addition, the anthocyanin concentration under UV-A radiation was significantly higher than that under white light. It is interesting that the anthocyanin concentration under UV-A + HRW treatment was further significantly increased compared with that under UV-A treatment. However, no significant difference was observed between W and W + HRW treatments (Fig. 1b). To investigate whether UV-A affects endogenous H2 production, gas chromatography was applied to monitor the production of H2. H2 concentration was significantly increased in sprouts treatment with UV-A radiation compared to the control (W). Under the same light condition, a significant increase in H2 concentration by HRW treatment was observed (Fig. 1c). To gain insights into the underlying mechanisms of HRW-promoted anthocyanin accumulation, mRNA sequencing of the hypocotyl samples after 24 h of light exposure were conducted. Differences in gene expression were examined to analyze the genes that may participate in HRW-promoted anthocyanin biosynthesis under UV-A. A total of 14,564 DEGs in radish sprouts were identified through pairwise comparisons, of which 186, 6602, 147 and 7629 DEGs were found between W + HRW and W, UV-A and W, UV-A + HRW and UV-A, and UV-A + HRW and W + HRW, respectively (Fig. 2a). One hundred thirty-seven genes were up-regulated and 49 genes were down-regulated under the W + HRW treatment compared with the W treatment. Comparison of the W treatment with the UV-A treatment revealed 3585 genes that were up-regulated and 3017 genes that were down-regulated in the latter. Forty-three genes were up-regulated and 104 genes were down-regulated under the UV-A + HRW treatment compared with the UV-A treatment. Twenty of the 3585 up-regulated differentially expressed genes between UV-A and W were also among the genes differentially expressed between UV-A + HRW and UV-A. 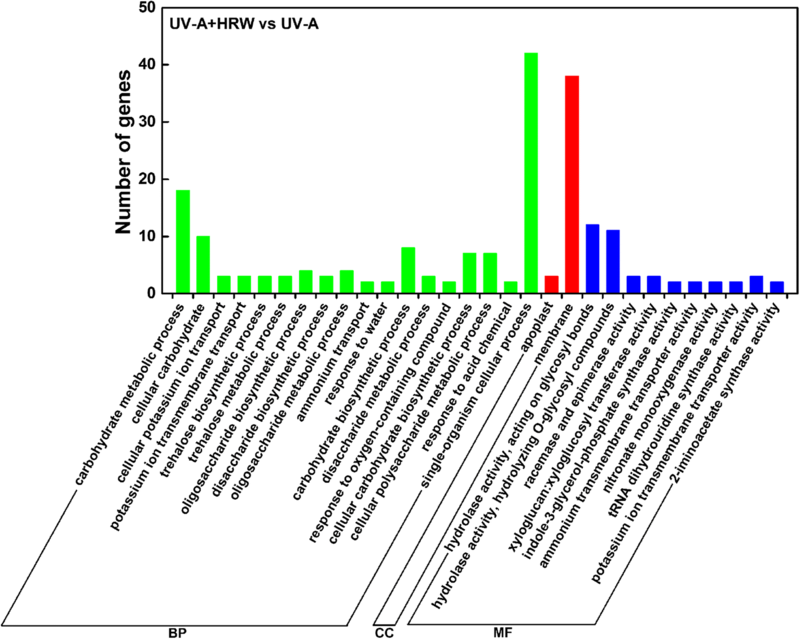 In addition, 19 of the 3017 down-regulated differentially expressed genes between UV-A and W were also among the genes differentially expressed between UV-A + HRW and UV-A (Fig. 2b). Furthermore, a general overview of the expression pattern was visualized in a heat map (Fig. 2c), which provided an overall understanding of the changes in gene expression. It was shown in Fig. 2c that the expression patterns of most DEGs under W and UV-A treatment were completely opposite, regardless of whether HRW was present or not. Most of the genes with higher expression levels under UV-A had lower expression levels under W, and vice versa. Besides, compared with that of UV-A, most of the DEGs displayed great differences in expression profile under UV-A + HRW treatment. To identify the HRW-induced genes under UV-A irradiation, the DEGs were evaluated with GO and KEGG pathway analyses. The proportions of enriched genes in the UV-A + HRW vs UV-A comparison were summarized in three main GO categories (Fig. 3). In the biological process category, the GO terms significantly enriched in the UV-A + HRW vs UV-A comparison included “carbohydrate metabolic process” and “single-organism cellular process”. In the cellular component category, “membrane” was significantly enriched. In the molecular function category, “hydrolase activity, acting on glycosyl bonds” and “hydrolase activity, hydrolyzing O-glycosyl compounds” were significantly enriched. To further explore the biological functions of the DEGs, an enrichment analysis based on KEGG database was performed. The top 20 pathways for the most prominent differential genes were listed (Fig. 4). In Fig. 4a, 4504 DEGs were identified in the UV-A vs W comparison, with 2562 up-regulated and 2026 down-regulated. These DEGs were mostly enriched in “ubiquinone and other terpenoid-quinone biosynthesis”, “ribosome”, “porphyrin and chlorophyll metabolism”, “photosynthesis”, “glyoxylate and dicarboxylate metabolism”, “fructose and mannose metabolism”, “carotenoid biosynthesis” and “biosynthesis of secondary metabolites”. While, there were 60 DEGs identified from the KEGG database in the UV-A + HRW vs UV-A comparison, with 29 up-regulated and 31 down-regulated. As shown in Fig. 4b, the DEGs were significantly enriched in “vitamin B6 metabolism”, “sulfur metabolism”, “starch and sucrose metabolism”, “nitrogen metabolism”, “lysine biosynthesis”, “indole alkaloid biosynthesis”, “glyoxylate and dicarboxylate metabolism”, “glycine, serine and threonine metabolism”, “galactose metabolism”, “C5-branched dibasic acid metabolism” and “2-oxocarboxylic acid metabolism”. 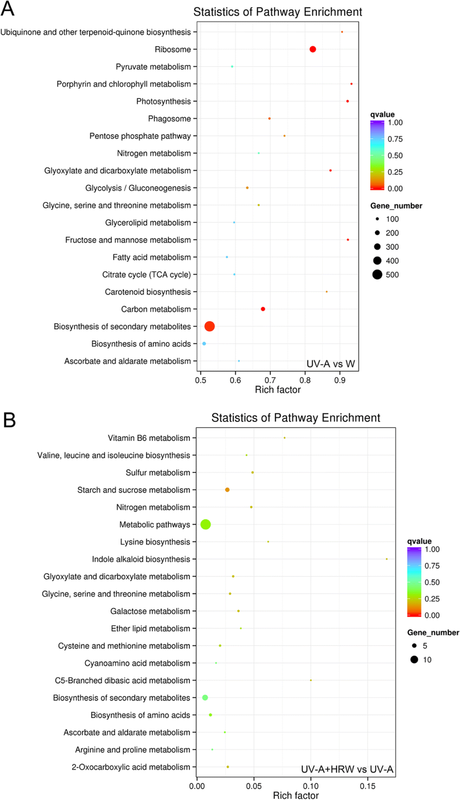 In particular, “nitrogen metabolism”, “biosynthesis of secondary metabolites”, “phenylpropanoid biosynthesis”, “starch and sucrose metabolism” and “metabolic pathways” were significantly enriched in the KEGG pathway analysis in the UV-A + HRW vs UV-A comparison. Anthocyanins are synthesized by the flavonoid pathway, and many enzymes participate in the catalyzing steps. In our current study, the transcript levels of 12 anthocyanin biosynthesis-related structural genes were analyzed (Fig. 5), and the expression levels of most of those genes were higher under UV-A than W. Ten putative PAL (phenylalanine ammonia lyase) genes were identified, most of which (except for Rsa1.0_71727.1_g00001.1 and Rsa1.0_00416.1_g00004.1), were up-regulated under UV-A + HRW compared with UV-A. Ten C4H (Cinnamate 4-hydroxylase) genes were identified. The expression levels of Rsa1.0_05875.1_g00003.1, Rsa1.0_07813.1_g00001.1 and Rsa1.0_40956.1_g00001.1 under UV-A + HRW were higher than those under UV-A. Five 4CL (4-coumaroyl:CoA ligase) genes were identified, among which the expression levels of Rsa1.0_05570.1_g00001.1 and Rsa1.0_08472.1_g00001.1 were higher under UV-A + HRW than UV-A. CHS plays an important role in anthocyanin biosynthesis, and six putative CHS (chalcone synthase) genes identified here displayed similar expression profiles, which were up-regulated under UV-A + HRW compared with UV-A., In addition, three CHI (chalcone isomerase) genes, two F3H (flavanone 3-hydroxylase) genes, one F3’H (flavanone 3′-hydroxylase) gene, one DFR (dihydroflavonol 4-reductase) gene and two LDOX (leucoanthocyanidin dioxygenase) genes were identified, and they showed expression patterns similar to those of CHS. In this study, 5 putative OMT (O-methyltransferase) genes were identified, and the expression levels of Rsa1.0_00866.1_g00008.1, Rsa1.0_06693.1_g00002.1 and R sa1.0_14791.1_g00001.1 were increased under UV-A and further increased under UV-A + HRW relative to W. We identified 24 putative GST (glutathione S-transferase)-encoding genes here. Fifteen putative GST genes were up-regulated under UV-A + HRW compared with UV-A, including Rsa1.0_00336.1_g00025.1, Rsa1.0_02928.1_g00007.1 and Rsa1.0_00370.1_g00004.1. In addition, 33 putative MATE genes were identified, and the expression levels of Rsa1.0_02494.1_g00005.1 and Rsa1.0_00065.1_g00071.1 were significantly up-regulated under UV-A + HRW compared with UV-A. Transcription factors play important regulatory roles in anthocyanin biosynthesis. In this study, a total of 94 transcription factors were identified as putative regulators of anthocyanin biosynthesis in response to HRW. These TFs included bHLHs (basic helix-loop-helix), bZIPs (basic region-leucine zipper), C2H2s (C2H2 zinc-finger proteins), C3Hs (Cys3His zinc finger proteins), FAR1s (far-red impaired response 1), WD40s, MYBs (MYB domain proteins), NACs (NAM/ATAF/CUC), TCPs (TCP proteins), WRKYs (WRKY proteins), and zf-HD proteins (Fig. 6). Among the various TFs, MYB composed the largest percentage (26.60%), followed by bHLH (17.02%) and WD40 (5.32%), indicating that the MBW complex might be the major determinant of anthocyanin biosynthesis under UV-A + HRW in radish sprouts (Fig. 6 a, g, h). All 16 of the putative bHLH TFs were significantly up-regulated under UV-A treatment compared to W, and UV-A + HRW treatment further promoted this effect (Fig. 6a). In this study, 25 putative MYB genes were identified, and most of them (except Rsa1.0_00145.1_g00031.1_0) were up-regulated under UV-A + HRW treatment compared with UV-A treatment (Fig. 6h). Furthermore, 8 putative bZIPs, 10 putative NACs and 9 putative zf-HDs were identified in this study, and their expression levels increased under UV-A + HRW treatment compared to UV-A, implying that these TFs might positively regulate HRW-promoted anthocyanin biosynthesis (Fig. 6b, i, k). In addition, 5 other families (C2H2, C3H, FAR1, TCP and WRKY) showed up-regulation or down-regulation under UV-A + HRW treatment compared to UV-A, implying that these TFs might be involved in HRW-regulated anthocyanin biosynthesis (Fig. 6). Light signals are perceived by plants through different classes of photoreceptors. CRY and PHOT mediate blue light/UV-A signal transduction. In our study, based on the KEGG and GO pathway annotations, three putative CRYs were found, and compared to W, their expression levels increased under UV-A but were lower under UV-A + HRW. Among the eight putative PHOT genes, the expression levels of Rsa1.0_08201.1_g00003.1 and Rsa1.0_51768.1_g00001.1 increased under UV-A + HRW compared with UV-A, although there was no significant difference. The expression level of a putative COP1 (Rsa1.0_02834.1_g00003.1) increased under UV-A compared with W and remained the same under UV-A + HRW. Expression of a putative HY5 (Rsa1.0_02208.1_g00006.1) decreased under both UV-A and UV-A + HRW relative to W (Additional file 2: Table S2). Plant hormones have a crucial role in the regulation of anthocyanin biosynthesis. It has been reported that ABA, JA, cytokinins and GA promote light-induced anthocyanin biosynthesis [45–48]. In our study, eight putative cytokinin-related genes were identified, of which the expression levels of Rsa1.0_00570.1_g00019.1 and Rsa1.0_01905.1_g00006.1 increased under UV-A relative to W. The expression level of one putative auxin-related gene (Rsa1.0_02398.1_g00002.1) decreased under UV-A + HRW compared with UV-A. We also investigated the genes of MAPK and calcium signaling pathways. We found that the expression levels of one putative MAPK signaling-related gene (Rsa1.0_00250.1_g00016.1) and two calcium signaling-related genes (Rsa1.0_00024.1_g00018.1 and Rsa1.0_07482.1_g00001.1) decreased under UV-A + HRW compared with UV-A. All of these results suggested that light and hormone signals play a vital role in UV-A-induced anthocyanin biosynthesis and might also take part in H2-promoted anthocyanin accumulation under UV-A. To validate the RNA-seq data, 16 anthocyanin biosynthesis-related genes were chosen for validation of expression by qRT-PCR analysis (Additional file 3: Figure S1). These 16 genes included those involved in UV-A photoreception and light signal perception, as well as transcription factors and structural genes involved in anthocyanin biosynthesis. In the qRT-PCR analysis, the expression of these genes showed patterns very similar to those of the FPKM values from sequencing under the corresponding treatments. These results indicated that the RNA-seq data were reliable. Radishes are members of the Brassicaceae, and radish sprouts are important edible vegetables that receive significant attention for their high nutrient contents and health-promoting effects. Anthocyanins, which confer vivid red hypocotyls that draw consumers to radish sprouts, are among these important health-promoting compounds. Therefore, various methods and technologies have been applied to produce radish sprouts rich in anthocyanins [29, 36, 49]. Light acts as an essential stimulus and a safe regulator for anthocyanin biosynthesis. In recent decades, the understanding of the mechanisms underlying light-regulated anthocyanin biosynthesis in plants has markedly increased [50, 51]. Specifically, UV-A could induce anthocyanin accumulation with little damage to plants. Molecular hydrogen (H2) has been identified as a novel antioxidant that can efficiently reduce oxidative stress. The progress toward therapeutic and preventive applications of hydrogen has shown that supplementation with hydrogen-rich water may have a role in preventing of insulin resistance and type 2 diabetes mellitus (T2DM) . More recently, studies on animals showed that HRW could protect against ischemic brain injury in rats, and the maintenance of parvalbumin and hippocalcin levels by HRW might contribute to neuroprotective effects against neuron damage . Therapeutic hydrogen has been administered by different delivery methods, including straightforward inhalation, injection with hydrogen-saturated saline and drinking hydrogen dissolved in water . In plants, external supplementation with H2 in the form of HRW protects plants from multiple environmental stimuli and enhances their antioxidant capacity [31, 32, 54]. Recently, it was reported that UV-B-triggered biosynthesis of (iso)flavonoids was substantially strengthened by HRW , and the accumulated (iso)flavonoids enhanced the tolerance of alfalfa to UV-B. Based on those cumulative knowledge, the beneficial biological effects of hydrogen have been preliminarily proved. In our recent study, the observation that UV-A-induced anthocyanin biosynthesis was further increased by supplementation with HRW was first reported . Furthermore, HRW significantly blocked UV-A-induced ROS accumulation and enhanced the activities of antioxidant enzymes to reestablish ROS homeostasis. However, to date, there has been no study on the identification of DEGs related to H2-promoted anthocyanin biosynthesis under UV-A, and little is known of related signaling pathways. This is the first study to investigate the transcriptional changes associated with anthocyanin accumulation under UV-A + HRW. The present study showed that the expression of most structural genes associated with anthocyanin biosynthesis was up-regulated by UV-A and UV-A + HRW (Fig. 5). The accumulation of anthocyanin in radish sprouts hypocotyls is a complex biological process that is driven by different regulatory factors, including plant hormones, transcription factors and other signal transduction pathways. In our study, 11 UV-A photoreceptors, including three CRY and eight PHOT, were identified (Additional file 2: Table S2). The transcript levels of most of these photoreceptors increased under UV-A compared with W and did not increase when HRW was applied. Downstream of the light receptors, the ubiquitin E3 ligase CONSTITUTIVE PHOTOMORPHOGENIC1 (COP1) acts as a molecular switch of light-induced plant development, mediating the degradation of various photomorphogenesis-promoting transcription factors by the Ub-proteasome system [13, 55]. ELONGATED HYPOCOTYL5 (HY5) is a bZIP transcription factor that has been linked to activation of CHS and the accumulation of flavonoids in response to light in Arabidopsis . One COP1 was identified in this study, and its transcript level increased under UV-A. Among the three HY5 found, the transcript levels of two increased under UV-A, and the other decreased. Interestingly, the transcript levels of COP1 and HY5 did not increase under UV-A + HRW compared with UV-A. These results indicated that the photoreceptors COP1 and HY5 might participate in UV-A-induced anthocyanin biosynthesis, but the expression levels of these photoreceptors were not affected by HRW. Plant hormones may be important factors regulating the light-induced anthocyanin accumulation. For example, auxin has been found to retard anthocyanin accumulation in apple and Arabidopsis [57, 58]. In the present study, the transcript level of one auxin-associated gene (Rsa1.0_02398.1_g00002.1) decreased (Additional file 2: Table S2), implying that it may participate in anthocyanin biosynthesis under UV-A + HRW. Other plant hormones, such as abscisic acid, cytokinins, and jasmonic acid have been reported to promote anthocyanin accumulation [45, 47, 48]. However, in this study, the transcript levels of most of those hormone-related genes remained unchanged under UV-A + HRW compared with UV-A. These results are not consistent with our expectation. Recently, it was reported that H2 could be a novel signaling molecule in phytohormone signaling pathways in response to biotic and abiotic stresses . Thus, further pharmacological experiments will be necessary to verify the role of phytohormones in H2-promoted anthocyanin biosynthesis under UV-A. In addition, one transcript encoding a gene involved in MAPK signaling and two transcripts encoding genes involved in calcium signaling were down-regulated under UV-A + HRW. Anthocyanin pigmentation is modulated by changes in intracellular Ca2+ level in Arabidopsis , and application of a CaCl2 spray could enhance accumulation of anthocyanins in strawberry . These results imply that Ca2+ may take part in H2-promoted anthocyanin biosynthesis under UV-A, although additional evidence needs to be obtained. The molecular basis of plant anthocyanin biosynthesis is well known. 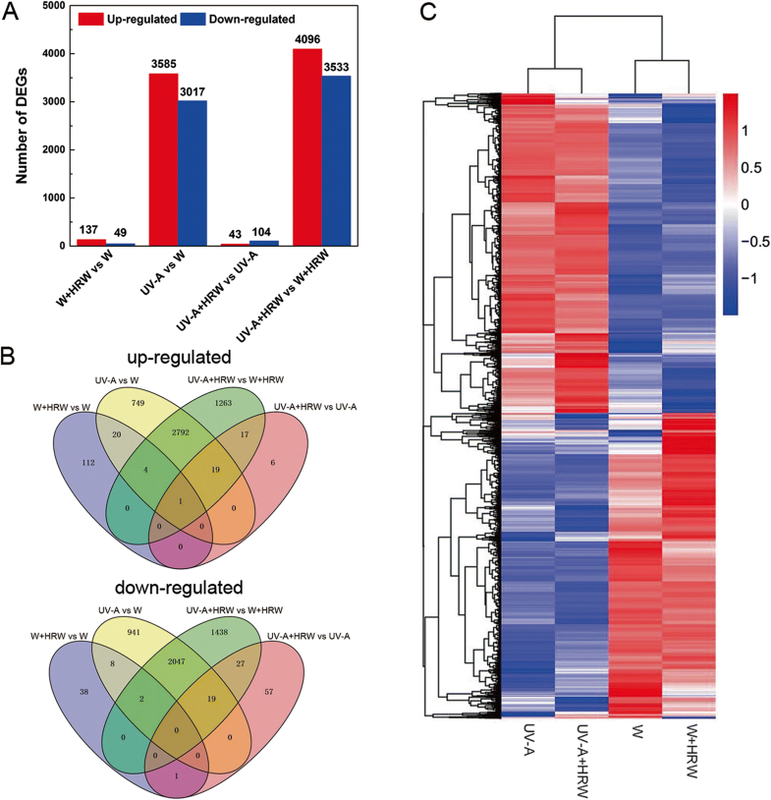 Transcription factors regulating the expression of flavonoid biosynthetic genes have been characterized extensively in Arabidopsis and other plants [16, 62, 63]. In Arabidopsis, three transcription factor families, including R2R3-MYB, basic helix-loop-helix (bHLH), and WD40-repeat proteins, constitute a ternary complex predominantly responsible for orchestrating anthocyanin biosynthesis . MYB proteins, which are widely distributed in all eukaryotic organisms, constitute one of the largest transcription factor families in the plant kingdom. The production of anthocyanin is predominantly regulated by R2R3-MYB . In this study, we identified 89 unique transcripts encoding members of 10 transcription factor families, which were annotated in anthocyanin biosynthesis in radish sprouts (Fig. 6). Among those TFs, 25 putative MYB-encoding genes, 16 putative bHLH-encoding genes and 2 putative WD40-encoding genes were identified. Those three TFs accounted for approximately one-half of the total number of TFs identified. This finding suggested that the MBW complex is likely to be the primary regulator of anthocyanin accumulation in radish sprouts under UV-A + HRW treatment. In peach, PpNAC1 can activate the transcription of PpMYB10.1 to promote anthocyanin pigmentation . In addition, it has been suggested that IbNAC1 has multiple biological functions in the JA response, including the inhibition of root formation and accumulation of anthocyanin in sweet potato . In our present study, 9 NACs identified in radish sprouts showed increased expression levels under UV-A + HRW treatment. In addition, the co-up-regulation of NAC and MYB implied that the activation of MYB might be associated with NAC. In our study, the expression levels of most transcription factors annotated in anthocyanin biosynthesis increased under UV-A and were further enhanced by HRW under UV-A. These findings showed that the regulatory effects of TFs might play vital roles in H2-promoted anthocyanin biosynthesis under UV-A. In this study, the H2 production of radish sprouts was significantly increased under UV-A (Fig. 1c). Similarly, the UV-B irradiation was reported to significantly increase the H2 content in alfalfa . We observed that endogenous H2 content increased under abiotic stress in higher plants, including alfalfa , Chinese cabbage  and Arabidopsis . In bacteria and green algae, a hydrogenase is responsible for H2 production . However, no reports have clarified the mechanism of H2 production in higher plants. With current levels of technology, it is difficult to answer these questions completely. In future, these problems will gradually be solved with improved scientific methods and increased attention to the physiological role of H2 in higher plants. Based on this transcriptomic analysis and previous studies, a putative regulatory network of HRW-promoted anthocyanin accumulation in radish sprouts under UV-A radiation was proposed (Fig. 7). Under UV-A radiation, UV-A photoreceptors, such as CRYs and PHOTs, perceive light signals and then interact with COP1, which interacts directly with positive regulators of photomorphogenesis, such as HY5. HY5 can interact with MBW complex or other transcription factors to regulate the transcription of structural genes. On the other hand, UV-A promotes the production of H2, which promote signaling pathways (such as phytohormones, Ca2+/CaM and MAPK), sugar metabolism and nitrogen metabolism to regulate anthocyanin biosynthesis. Supplementation of HRW significantly increased the H2 concentration. This could at least partially explain why anthocyanin accumulation was substantially improved by HRW under UV-A. 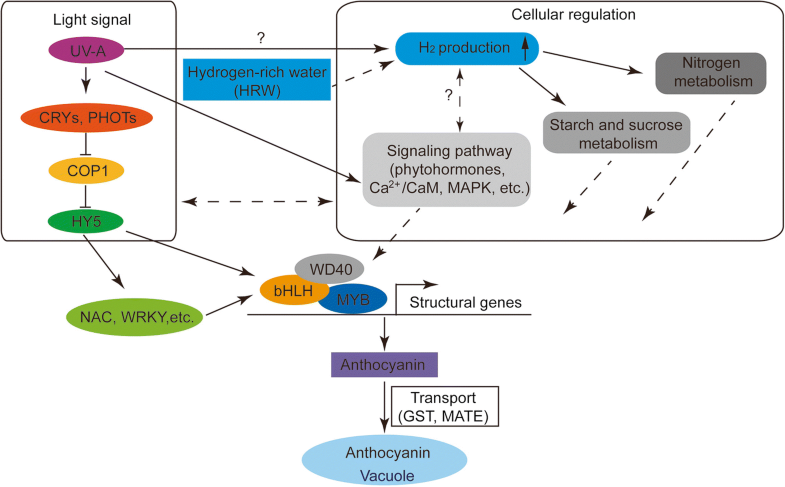 Further physiological and molecular experiments should be conducted to provide more precise insight into the mechanisms of HRW-promoted anthocyanin biosynthesis under UV-A, as well as the production of endogenous H2. Four sets of transcriptome data comprising 80,522 unigenes were identified in radish sprouts by Illumina sequencing. A total of 14,564 DEGs were identified through pairwise comparisons. GO and KEGG pathway enrichment analyses revealed the DEGs involved in HRW-promoted anthocyanin biosynthesis under UV-A. Genes encoding light signal transduction elements, anthocyanin biosynthesis-related TFs and structural genes, and anthocyanin biosynthesis-related signaling pathways were also identified. The transcriptome data provided valuable information and gene sequences to accelerate the process of revealing the regulatory mechanism of HRW-promoted anthocyanin biosynthesis under UV-A in radish sprouts. In addition, further studies are needed to confirm the precise mechanisms by which H2 regulates physiological processes. We thank the Beijing Biomics Biotech Co. Ltd. for excellent technical help in bioinformatics analysis. This work was supported by the National Natural Science Foundation of China (Grant No. 31572169). We have deposited our data in Sequence Read Archive (SRA) (http://www.ncbi.nlm.nih.gov/sra/), the accession number for our submissions are: PRJNA388018. Conceived and designed the experiments: XZ and NS. Performed the experiments: XZ, LJ, JYT, HL. Analyzed the data: XZ, LJ, LH. Wrote the paper: XZ, ZS, JC. All authors have reviewed and approved the manuscript.